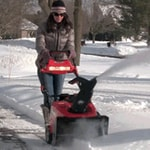 Single-stage snow blowers are great for light snow, but tend to have difficulty handling heavy snow and ice. Now with the addition of a Snow Shredder auger, Snapper and Simplicity have enabled certain single-stage models to handle the tougher stuff. These offer you the chopping power of a two-stage snow blower, but with the handling of a single-stage snow thrower. 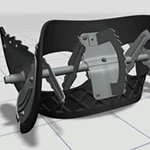 Snapper and Simplicity are now building single-stage snow throwers with patented SnowShredder augers, which combine 14 welded, serrated steel blades and reinforced rubber paddles. These augers make it possible to chop up and grind down compacted snow and ice, while at the same time, still being able to quickly clear all the way down to the pavement. Some people find larger two-stage snow blowers hard to maneuver. The new SnowShredder auger makes it possible to have the extra chopping power of a two-stage snow blower while still maintaining the maneuverability of a single-stage snow thrower. 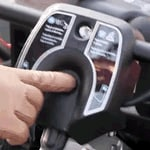 The units also come equipped with an ergonomically designed handlebar and easy-to-use controls to enhance maneuverability even further. To make these innovative machines even better, they come equipped with handle-mounted chute rotation control, so you can quickly and accurately direct the snow where you want it without stopping. They're also available with push-button electric start that'll get you going on extra cold days, as bone chilling as -20 F. Plus, if it doesn't start within two electric start attempts, Briggs & Stratton will fix it for free! New Single-Stage Crushes Compacted Snow.. Our Power Equipment Direct how-to library can help you learn about Top-Rated & Best-Selling Three-Stage Snowblowers, Farmers Almanac Winter Weather Predictions and Proposition 65 Product Labeling.